A Canadian Web site that lets you be as social in death as you are in life is now offering users the chance to share their organ donation wishes online too. Mysendoff.com, which launched in beta format last June, uses socialmedia to let people create final messages for loved ones andsharetheir funeral planning wishes with friends and family before they die. Now the Sudbury,Ont.-based site has launched a free Facebook app tohelp people make their organ donation plans known in advance as well.The Giving Means Living app was officially made available Mondaynight. 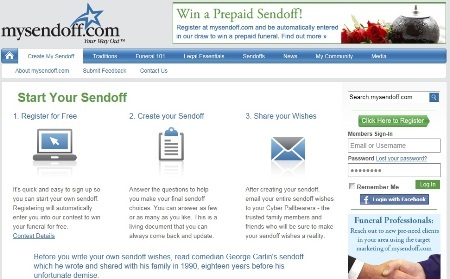 Mysendoff.com lets you share yourfinal wishes with loved ones … before you die. Anyone who has a Facebook account can find the app on the Mysendoff.com Facebook page, then click on the app to choose which organs they want to donate. When the user posts their donation intentions on their Facebook wall, that information is then shared with their Facebook friends so their wishes can be carried out after they passaway. “The ball is rolling now and if we can get our shoulder behind it to keep it going, we’ll hear more (organ donation) stories. I hope people really grab onto this,” Firth said. Giving people a free app to click on also simplifies a process that is on many people’s to-do lists but often isn’t followed through, Firth said. According to the U.S. charitable group Donate Life America, almost 90 per cent of North Americans support organ donation but only 30 per cent actually take the steps necessary to donate their own organs. Using social media to simplify another process that’s sometimes seen as taboo and time consuming – the task of communicating final messages and funeral arrangement wishes to loved ones — also motivated Firth to launch the site Mysendoff.com in the first place. Since it’s free to use the Mysendoff.com site tools and the organ donation app, the Web site’s revenue model is based on advertising. When someone visits Mysendoff.com, the site is programmed to bring up ads for local funeral service providers in their area based on the location data of their IP address. Incorporating social media is just part of the natural evolution of the funeral and estate planning industry, said Rob Jardine, co-owner and managing director of Jardine Funeral Home, Cremation and Tribute Centre in Fenelon Falls, Ont. “We’re starting to move toward the baby boomer era and their approach is a lot different than their parents. So we just want another avenue to show them there are new, fresh ideas out there with funeral services and we’re a part of that growing trend,” said Jardine, who advertises his funeral home on the Mysendoff.com Web site. About 100,000 people have visited the Mysendoff.com site and 5,000 have registered to use its online social media sharing tools. There are no user figures yet for the organ donation app because it’s too new, Firth said. Sites for sharing last wishes, funeral plans and memorial tributes have become more common online, with thedigitalbeyond.com home page listing dozens of sites (such as lastwishbook.com) offering similar services. Firth has tried to make Mysendoff.com stand out by setting it up as a portal of general news and information about funeral planning and broader issues surrounding death, grief and loss. (A sampler: one cheeky infographic maps out celebrities who have acted as pallbearers for other Hollywood stars.) The site has a staff of 12 writers, developers and designers to keep that portal content fresh. Mysendoff.com is running a contest to win a free funeral worth exactly $6,457.10 (Firth said that’s the average cost of a traditional sendoff service in North America according to the National Funeral Directors Association, a global industry group based in Washington, D.C.). Has anyone objected so far to the site’s exceedingly practical approach to one of life’s most intensely personal milestones?